Studio portrait of 84 Sergeant (Sgt) William ‘Jack’ Echlin Turnley, 1st Field Company Engineers. A British migrant from Liverpool, England, Sgt Turnley had served 2 years with the Volunteer Rifles and 5 years with the Territorial Army before emigrating to Australia to work as a telephone mechanic. 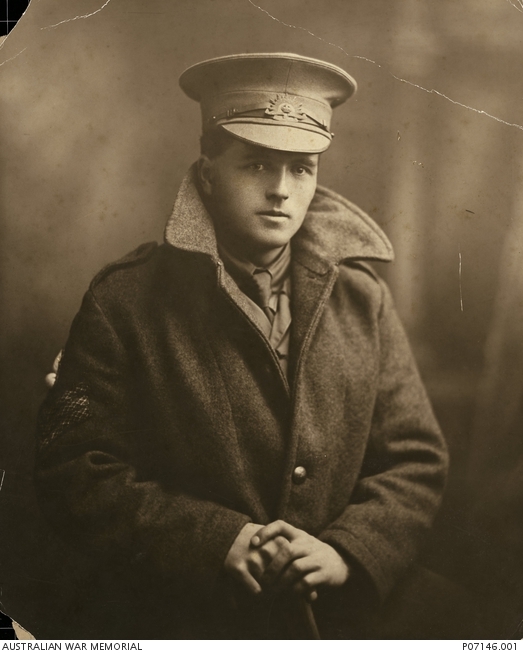 Enlisting in August 1914 with the rank of Lance Corporal (LCpl), Turnley left Australia for Egypt in October 1914 and took part in the Gallipoli Landing on 25 April 1915. He was wounded in July 1915 but remained on duty, and was promoted to the rank of Corporal (Cpl) the following month. In August the was attached to the Divisional Engineers Headquarters and promoted to Acting Staff Sergeant in September, but reverted to the rank of Cpl in November. He developed oedema in the left leg and was eventually repatriated to Egypt, where he developed cardiac complications. Cpl Turnley was found unfit for active service and was repatriated to Australia where he was discharged from the military in August 1916. William Turnley returned to civilian life and worked as a Shire Clerk in Coraki, NSW. He died at Annandale, NSW, in 1934, aged 43. Cpl Turnley’s haversack which was used to form part of the first defensive parapet to be built at Anzac Beach at Gallipoli on 25 April 1915 is currently held by the Australian War Memorial at RELAWM09176.